I’m told to get a buzz out of life take a kid fishing. So I asked the kid would he like to go to Merrijig with the club for a weekend of fly fishing. Well the kid is 28 but he agreed, so a crash course of approximately 1 hour of casting on the green banks of suburban Mt Martha, i.e., the nature strip, Then it was off to the Gentleman’s outfitters – the shed where waders, vest, rod and reel were selected and we were ready for the weekend. Friday afternoon saw the kid on the Delatite with clear water, sunshine and a casting style that was looking alright but no fish. Saturday saw four of us walking down the slope to Gardiner’s hut on the Howqua. Once again great looking water a magnificent setting and still good weather. So with a few more casting and upstream craft instructions we let the kid loose. Several trees, the odd wind knot, a bird’s nest, loss of several flies and did not see or hear a fish move anywhere, it wasn’t looking great. 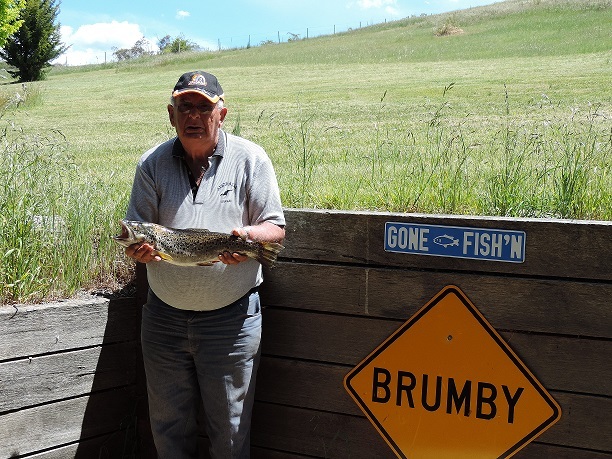 The day ……..
Whilst members attended the Club Trip to Merrijig, Bruce and Bob were in Jindabyne with a boat they towed up for a spot of lake fishing. 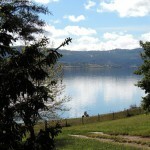 The report is that the weather was great but the fishing was crap! I understand that the salmon that Bruce is holding was devoured by the pair of them at an evening meal. 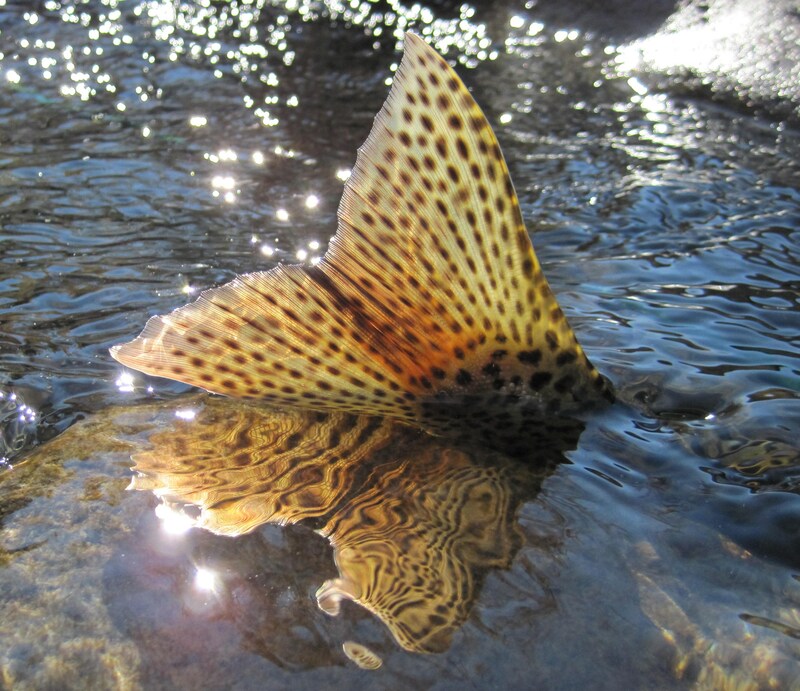 After the last few fishing reports from all over – Wastell, Lake Fyans Fly in, Merrijig and now Jindabyne – that the fish are taking their Xmas break early!! 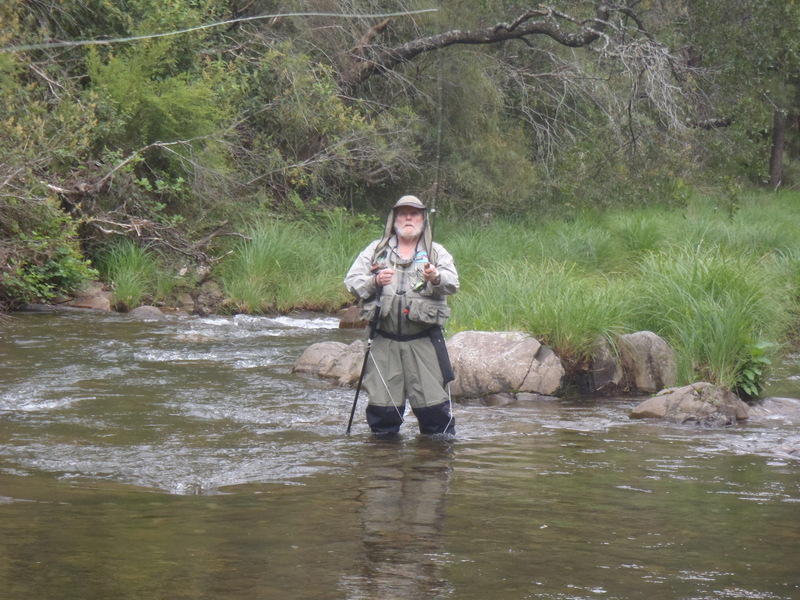 Eleven members attended the annual Merrijig weekend fishing the Delatite and Howqua Rivers – with some venturing further afield. Friday night saw some venture down to the Delatite around the vicinity of the bridge where a couple landed fish, before returning to the accommodation at Victoria Police Ski Club. 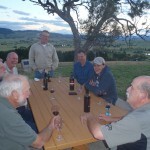 After dinner members engaged in the usual fishing banter and as usual the stories got taller with the consumption of a few convivial drinks. Saturday morning members moved off in groups to fish their selected spots full of anticipation for a great day’s fishing ahead. There were lots of campers by the rivers but very few fishers – an ominous sign for the day ahead! 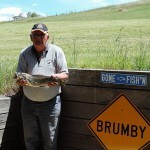 Despite a hard day’s wading and trying a number of presentations nobody managed to even see a fish – let alone land one. Saturday evening was spent in pleasant company around the lounge exchanging fishing tales before heading to bed for an early night. Sunday, after the clean-up was done members moved in various directions to fish other rivers on the way home. 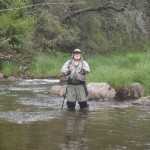 Another great Club Weekend – despite the disappointing lack of fish. The Ballarat Fly Fishers Club is hosting an evening with April Vokey on Monday 10th of March, 2014. 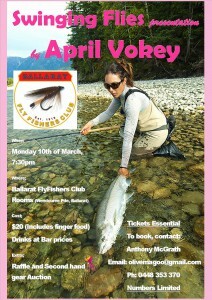 April will be doing a presentation on swinging flies and talking about her Steelhead experiences in their Club Rooms on the banks of Lake Wendouree in Ballarat. Tickets are only $20 per person, however bookings are essential and numbers are limited. 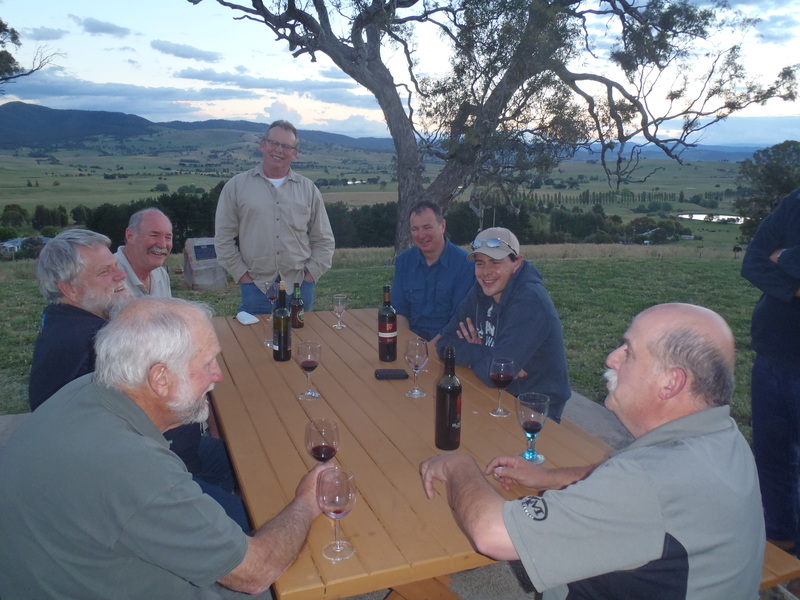 The event aims to raise funds to assist BFFC members who have been selected to represent Australia at International level in Competition Fly Fishing. Gavin is hosting movie nights at his Bentleigh Shop. These are great nights with lots of food, drink and gifts. Greetings fellow fly fishers. Well it’s been a busy month with the Fly-In at Lake Fyans followed by the Wastell Trophy at Cairn Curran the weekend after that. After all that fishing and no fish, but I can say I had a lot of good company, all in the same boat!! To finish the month I was joined by 14 other members in a weeding day at DevilBend’s Conservation area. I hadn’t expected the weeds (small trees) to be so big but that didn’t deter our gallant band of workers. Many thanks for a job well done fellows. It should earn the club a few brownie points with Parks. 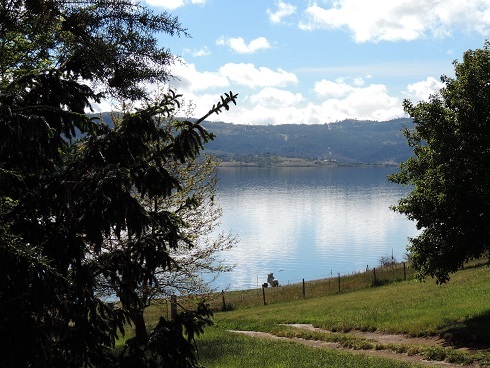 Hope to see you on the water some time soon……….